My daughter is a doughnut fanatic, she truly loves doughnuts. All doughnuts, all shapes and sizes. She has been asking for me to make churros for some time now, I keep avoiding it as I think it will be difficult. 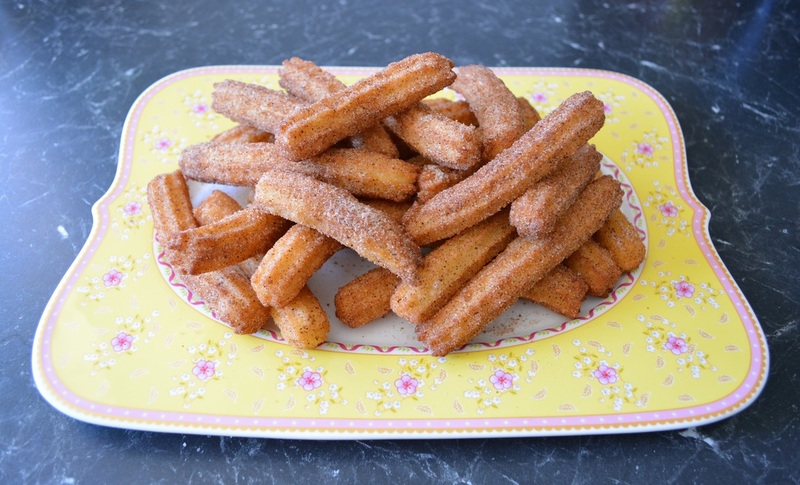 Well I was wrong, these are so easy to make, and I mean really easy, I'm talking, in 10-15 minutes you have a batter ready for frying, in 30 minutes, you are already eating churros. Before I posted this recipe I tried one other recipe so I have a comparison. These were far better, the other recipe I tried were very oily, they left an oily taste in your mouth after you ate them. These were crisp on the outside and nice and soft in the centre. I also tried a chocolate version, but they were a bit dry and cakey. Now, oil temperature, these really do need to cook for at least 5 minutes, if yours are cooking too quickly reduce the oil temperature. If cooking too slow, increase the oil temperature. I generally use the hottest burner, but have it set at a low to medium heat, more low than medium. When you add the eggs, start beating straight away, to ensure the eggs don't start cooking in the hot dough. I fry about 5 or 6 churros at one time, and I never measure them, that is why I say you get between 25-35 churros. If you don't like cinnamon, just roll in plain caster sugar or vanilla sugar. Churros is often served with a chocolate sauce, we tried that, but we prefer them plain, so I have not added any recipe for chocolate sauce. So if you are like my daughter and you love doughnuts, give this a go, it is easy and quite fast to make, and best of all they taste great. Place the water, sugar and butter in a medium sized saucepan. Bring to the boil. Once boiling, add the flour, beat with a wooden spoon over a high heat until the mixture comes away from the base and side of your saucepan and forms a smooth ball. This does not take long at all. Transfer the flour mixture to a small bowl, beat in the eggs, one at a time, using an electric mixer, beat until the mixture becomes glossy. Spoon the mixture into a piping bag fitted with a 1cm fluted tube. Heat oil in a large saucepan. You will need at least 5cm of oil in your saucepan. Pipe 6cm lengths of the batter into the oil (cut off lengths with a knife). 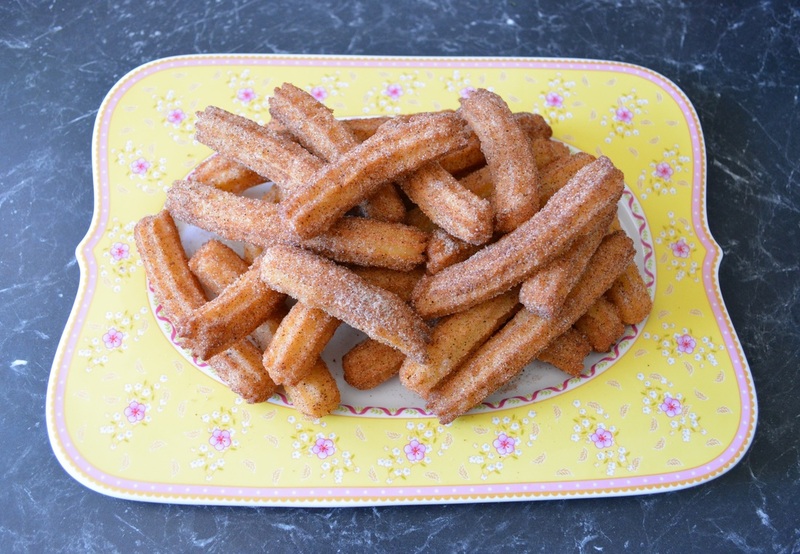 Deep fry churros, in batches, for about 5-6 minutes or until lightly browned and crisp. Drain on absorbent paper. Roll churros in cinnamon sugar. Serve warm.